Love a good savory pancake? 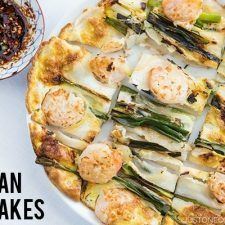 You’ll have to give this absolutely delicious Korean Pancake (Pajeon 파전) recipe a try! Enjoy with a spicy soy dipping sauce. Cut the end of scallions and then cut in half. Beat the egg in a small bowl and set aside. Combine cake flour and salt in a medium bowl to make batter. Slowly add cold water and whisk till just combined. Do not over mix the batter because it’ll create gluten and the pancake won’t have good texture. Place a non-stick frying pan over medium high heat and add the oil when the pan is hot. 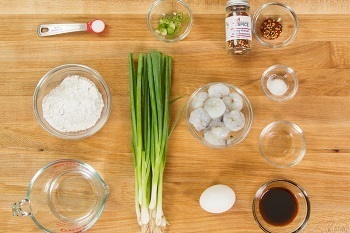 Then spread out the scallions on the bottom of the pan and add the shrimps. Drizzle the batter to cover the scallion and shrimp, and make sure there is batter between the ingredients so that they will be held together. 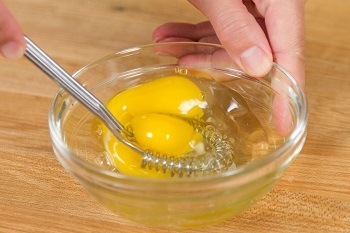 Lightly pour the beaten egg (I usually use half of one egg) over the batter. Cook for 3 minutes, until the edge of the pancake gets crispy and the bottom of the pancake is nice golden brown. Flip and cook for another 3 minutes, pressing down the pancake with spatula occasionally, until the pancake is crispy and golden brown. Flip one last time and cook for 30 seconds. Transfer to a cutting board. Cut into small pieces and enjoy with the dipping sauce. Then sift the mixture 2-3 times to evenly distribute the cornstarch. Don’t cut down on the amount of scallion. Ideally you want to fill the pan so that pancake will be held together when you flip. Don’t put too much batter otherwise you end up with doughy pancakes. Adjust the heat according to your gas/electric stove top. My heat indication works for my stove, and it’s just a suggestion. If you’re worried about flipping large pancakes, make smaller round pancakes with shorter scallions so you can easily flip.